I’m in Denver at SMX Local & Mobile. I’m in my hotel room and some jerk is smoking and it’s coming into my room. I don’t mean to imply that smokers are jerks either, I’m a former smoker and on frequent occasions it smells good. But right now, it’s giving me a headache and it just plain stinks. This is also a non-smoking floor. So, he/she is a jerk. I’m about to chill out to some local news and continue reading David Weinberger’s new book Everything Is Miscellaneous. But I wanted to letcha know that for the 2 days of the conference, which starts tomorrow, I’ll try to post a bit of a daily digest on things I picked up and observed. I hope I do a good job of it. I’ll likely post at the end of each day (there are only 2 of them). P.S. – Sorry for the light blogging. I think I’ve been too busy to blog, which isn’t cool – isn’t cool at all. I’ll post an update soon though! Perhaps I’ll type something up on the flight home. CitySquares is seeking testers. We’re about 1 month from launching the new and greatly improved Citysquares.com. It’s a huge upgrade, and a vastly improved experience for people (they’re not “users”!) and for businesses. While the new site will be ready to be previewed on an invitation basis in about 2 weeks, we’re going to need some testers. This is a great opportunity for teenagers, after school, and for college students looking for an extra buck. Testers must have their own laptops. Testers come to CitySquares’ office in the South End of Boston during specific hours, each day for a few days in early October. Some testers may be able to work from outside the office. Again, there’s more info to come on the new site, and also on the testing schedule and those details. But if you are interested, please email us at testing@Citysquares.com. As I sit here at my desk and look out the window, the trees I see are still green. There are no oranges, no reds, no yellows and purples, yet there is a dryness in the air, and a slight coolness about it. Ah yes, autumn is slowly creeping into New England. And that also means that the fall conference season is among us too. In addition to WebInno, which is always a fantastic event that only seems to be getting larger and more energized (if that’s possible), there are a few conferences that I’m planning to attend this fall. If you have interest in the local space, I definitely encourage you to attend these too. SMX Local & Mobile – October 1 & 2, in Denver, CO.
Local & Mobile search promises to be the next “big opportunity” for interactive marketers. The consensus prediction is for $8 billion in ad spending by 2010. The market is fragmented … and getting more so with new platforms launching weekly. Search engines and online directories want a piece. So do niche players carving out positions in product/service market segments. Add the mobile carriers and the recipe for a stew of confusion is complete. I’m looking forward to this one, as it’s my first Search Engine Land event, and I’ve heard and read good things about their events. Also, Greg Sterling will be moderating most of the panels and I’m a big fan of Greg’s blog. Then there’s ILM:07, in Los Angeles, CA, November 28-30. Interactive Local Media 2007 (ILM:07) and Search Engine Strategies Local (SES Local) are coming together in November to deliver THE blockbuster local search and online local media event of the year. If you have a stake in the future of local search and online local media, then ILM:07 may very well be the most important conference you will attend this year. ILM is the one conference that I’m really the most excited about. I’ve long heard so many great things about it and finally I get to go! Peter Krasilovsky is organizing much of it and I’m a big fan of Peter’s blog and all he does in the local space. There is also Web 2.0 Summit, Oct 17-19 in San Francisco. Where are the greatest opportunities, and the greatest risks? At the Web’s edge—the places where the Web is just beginning to take root: the industries, geographies, and applications that have yet to be conquered by the Web’s wide reach. For the past three years, the Web 2.0 Summit has explored ideas which have already begun to slip into the mainstream. This year, we’ll highlight news from unusual suspects—the enthusiasts and dreamers touching the edges of spaces not yet conquered by the Web, as well as established players who are looking to expand into new and previously unimaginable realms. I’m still not confirmed for this one, but I’ve listened to all the podcasts from last years summit, and I’m damn anxious to attend this one. So anyway folks, if you’re planning to attend any of these conferences, or if you can recommend any others, please shoot me an email. I’m not about to hyperlink to my email address here on my blog, so you’ll just have to guess what it is @ citysquares.com. 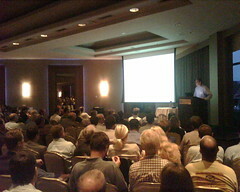 Yet another webinno. And it keeps getting better.